A caffè mocha (a coffee creation which is similar to a drink called a mochaccino, the cappuccino version) is traditionally defined as espresso, chocolate and hot milk; it’s a chocolate-flavored variant of the standard caffè latte. Mexican chocolate gives this coffee drink a special twist, as the chocolate normally used is a chocolate syrup. Serve this Mexican mocha latte with breakfast, brunch or even just alongside some pan dulce. I personally like to dunk orejas in my coffee! I prefer to use Oaxacan chocolate discs whenever I can get my hands on them, but if you don’t have a source to buy them from, you can use brands such as Ibarra, Abuelita or Taza, all of which are available in my online shop (those affiliate links will take you to my store; I receive a small percentage of each sale) and they’re easily found in many supermarkets and specialty stores in the U.S. as well. 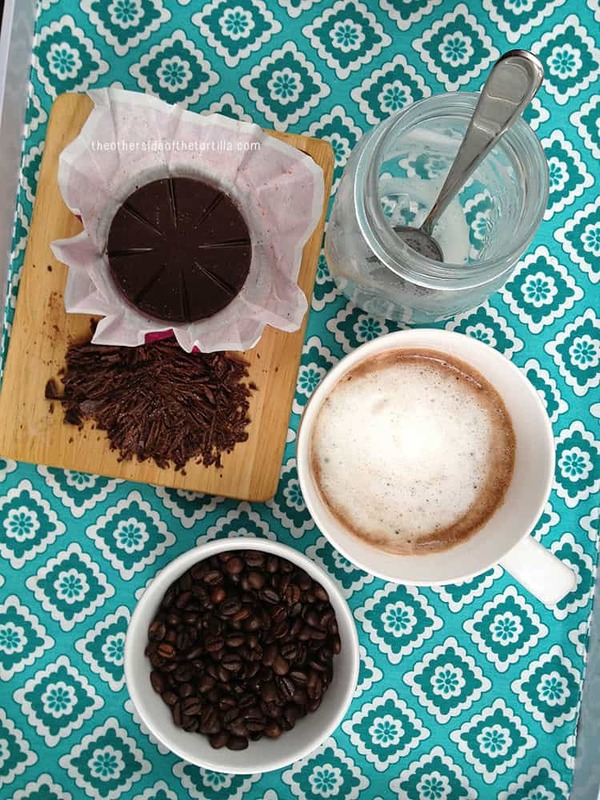 Make your own chocolatey latte with espresso or strongly brewed coffee, Mexican chocolate and milk. Plus: An alternate method for making latte foam with a glass jar! Brew two shots of espresso or 1/3 cup of strongly brewed coffee. Set aside. Finely chop two tablespoons of Mexican chocolate (you can also use a cheese grater if you're not confident with a knife) and add to the coffee. Stir to dissolve. Add the optional 2-3 teaspoons of sugar if you'd like the latte to be a little sweeter. Steam one cup of milk with a little foam and pour over the coffee and chocolate mixture. Add the foam on top and serve. *If you do not have a milk steamer or espresso machine for creating foam, see note below. *Cook's tip: If you don't have a milk steamer or espresso machine for steaming and creating foam from milk, use a glass jar that holds at least two cups of liquid. Pour one cup of milk into the glass jar, screw on the cap to seal and shake vigorously for 1-2 minutes to create foam. Remove the cap and microwave at 30-second intervals until the milk is hot enough for your liking. The short intervals in the microwave will stabilize the foam. One it's reached your desired temperature, use a large spoon to hold the foam back while pouring the milk into the coffee, and then spoon the foam on top. This recipe originally appeared in the Brunch with Mom bilingual ebook.